You never know what might come in the store on any given day, but last Thursday was truly the exception. A dealer I do a fair amount of business with (let’s call him Mongo) came to the store with a zip case full of pens. This is quite normal for him since he will scavenge for pens in all the places you and I might do the same (i.e. flea markets, antique shops, and even pawn shops). But his case wasn’t full of the usual assortment of new and vintage stuff, both good and not so good. This time his zip case was filled with 36 Black Snake fountain pens and matching ballpoints. 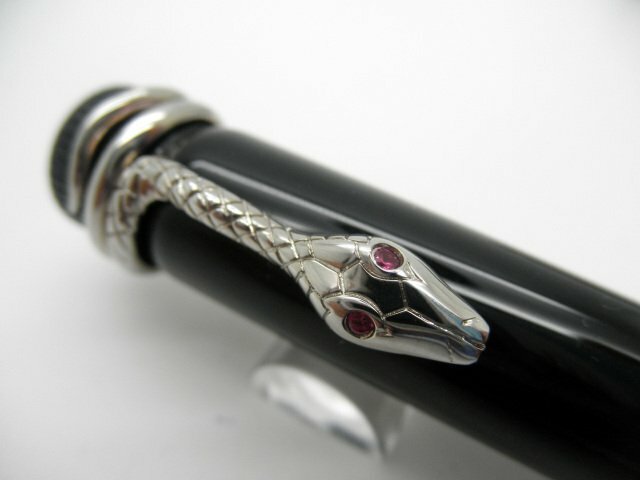 My initial thought was that they look like something else, but upon looking at the collection it was clear these pens were just black pens with a really cool snake for a clip. 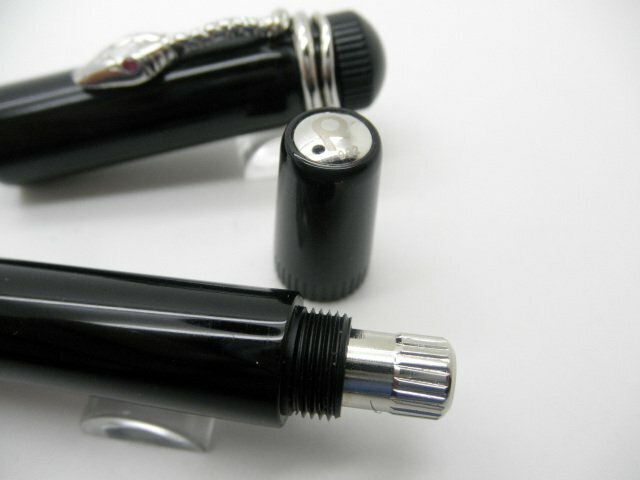 The fountain pen comes comes with a standard steel nib. Embossed on top is the letter P.
Take a closer look at the threading at the nib section base and you might think this is an eyedropper filled pen. While that would be clever, the pen does have a simple filling system where one will remove the blind cap on the end of the pen and fill using the piston. 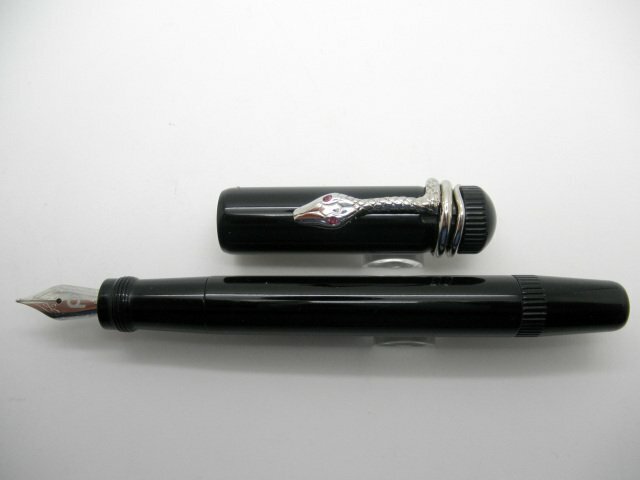 Overall, the Black Snake fountain pen is small by comparison to other fountain pens. Dimensions are below. Ink Capacity: 1.5 standard cartridges. Comes in a standard black box with pen sleeve to protect your pen. While the fountain pen is truly beautiful, or one might say simplicity refined. The ballpoint (yes, ballpoint) is as equally stunning an instrument. I don’t know for certain, but I’m sure these pens were made in Asia, the land known for making some really cheap pens, as well as well-known brands like Cross, Parker, and Sheaffer. The ballpoint has a wonderfully balanced feel to it, thick in size but not fat. 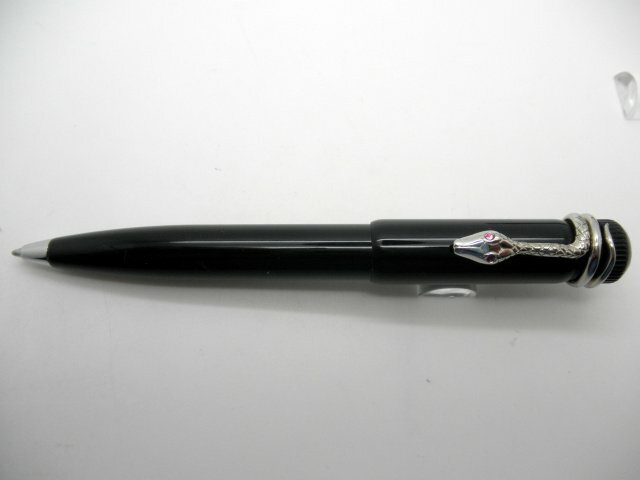 I would compare the size to one of my favorite ballpoints, the Pelikan K600 (and is half the price). But I’ll go one further. The Snake is a skoach bigger which makes it perfect in size for this writer. The pen has a smooth and responsive twist action mechanism delivering a pleasant quarter turn for advance and retraction. 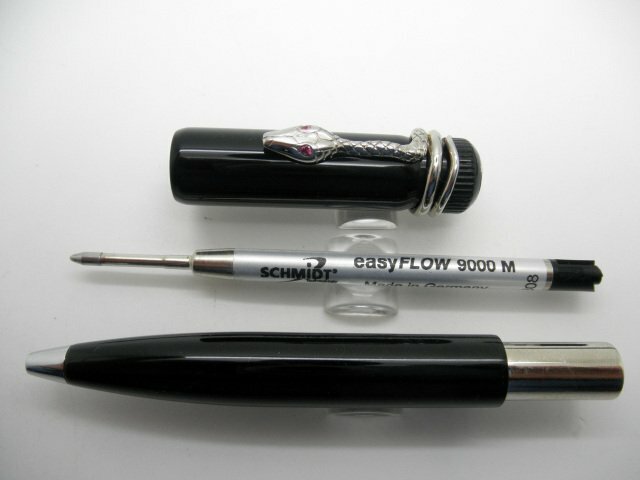 Equipped with a Schmidt EZ Flow refill. Bertram’s Inkwell will always recommend the Monteverde Super Broad Blue/Black refills. The ballpoint comes with the same box and protective sleeve as the fountain pen. In summary, these two pens really are something special. They’re truly a great value in a world of pens that can be outside of many people’s pen budget. I feel the quality is high, and longtime writing enjoyment is certain. Thanks for reading. Share it if ya like it.